Yesterday I found my 80-year old mother sorting clothes for a 3-week vacation with her church group through Scandinavia and Russia, including a few pre-tour days in Paris! She asked her doctor and he told her “have fun and send me a postcard!” She said she didn’t tell me because I would’ve lectured her on all the reasons she shouldn’t go. She’s always been active, but I don’t think this is wise for someone her age. When I told her so, she asked me to leave before I ruined the trip for her. Now what do I do? Ask mom’s fellow travelers for suggestions and buy mom a wonderful Bon Voyage present! 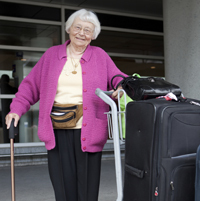 As a healthy and active 80 year old, it’s her call and it sounds like she’s done everything right: she has medical clearance, is traveling with a group of friends, and is looking forward to an interesting and exciting vacation.